So this is the final preview piece, as the show gets underway tomorrow night! Lucky Bar downtown Victoria will be the place to be for any fan of the singer/songwriter. 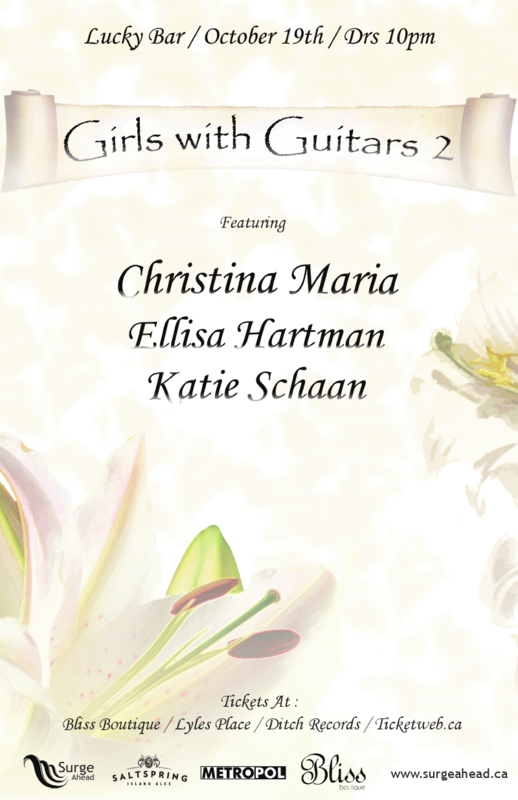 You’ve already had a chance to learn about Ellisa Hartman and Katie Schaan, and I’m sure you’re looking forward to learning about Christina Maria! Well lucky for you all, that piece is coming soon, as Christina has been kind enough to sit down with Island SoapBox before the show. That of course brings me to the point of today’s post. I want you all to have the chance to ask Christina anything you would like to know! You can leave a message at the bottom of this post, you can also send me an email, or hit me up on twitter! Both Ellisa and Katie both mentioned being excited about playing with Christina, and I myself am very excited for both the show and the interview. She’s a very talented artist, who calls many places on the globe “home”. She is currently involved in the Peak FM Performance Project (the one I keep telling you all to vote in, you can until Midnight Monday!). 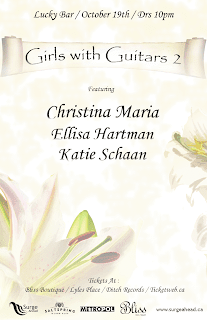 "Girls with Guitars 2" promises to be an excellent night out. Sponsors will be giving out prizes, the bar itself is a great venue, and the talent on stage is first rate. Come out, grab a beer and watch some live music. How often does that disappoint?